A little late on this one considering it happened exactly 1 month, 1 hour and 19 minutes ago. This time it was the turn of Mike C. (We have a lot of Mikes at LAB. And Tonys. That’s just how we roll.) 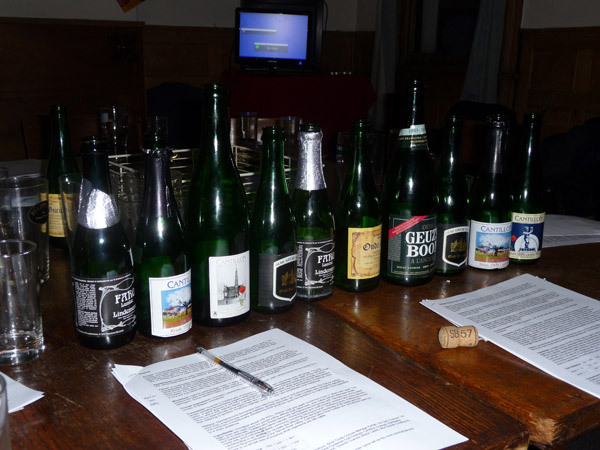 It was another bumper month for style-talk beers, this time a flight of 10 fantastic Belgian Guezes. Along with a photos from several brewery tours Mike took us through the origins, production and blending of these unique beers in what was a very interesting and informative session. The next meeting is tonight, Jan 5th where we will be learning to identify taste flaws caused by wild yeasts, and a guide to Mike E’s marvelous brewery.